Mrs. Sunita Vyas is a serial entrepreneur with a drive for growth and a passion to build great companies. Over the last two decades she has forayed successfully into the Education, Entertainment and Marketing Sector. 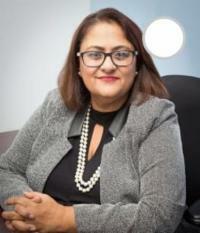 Currently as the CEO of Academy of Learning College, Mississauga and as a Board member of National Association of Career Colleges (the apex body in Canada that strives to promote the interest of Private Career Colleges at the Federal Level), Sunita brings a wealth of experience and knowledge specific to the Canadian Education Sector. Moreover, having trained thousands of adult students in the last decade, Sunita is in a unique position to set the course for successful international collaboration in the sphere of College Education. Besides adding two new campus locations to the current college, Sunita is also actively engaged with the Indo Canadian fraternity and the local business community. She currently serves on multiple committees in MBOT (Mississauga board of Trade) & ICCC (Indo Canadian Chamber of Commerce). She also volunteers her time as the Vice president of RANA (a cultural not for profit organization) and ‘Women That Give “(NGO). Sunita is currently on the board of Directors of Bohra Bros. – perhaps the oldest Movie Production House in Bollywood with over 200 movies to its credits. Some of the recent movies produced by Bohra Bros include Gangs of Wasseypur, National Award winner ‘Shahid’, Shahib, Biwi & Gangster, Tanu weds Manu, and Shaitan. She is actively working to expand the production base of Bohra Bros. in Canada.